A “Meet the Artists” Reception for the Annual Art Faculty and Invited Art Alumni Show is happening this Sunday, Feb. 2, 2014, from 1-3 p.m., at the Fine Arts Gallery in Blue Bell, PA. The show opened Tuesday, January 21, and will continue through Friday, February 14. “Winter Tea in Kennett” by Karen Kappe Nugent, oil on canvas, 14″ H x 18″ W.
This is a show where invited alumni of the college art program and faculty show their work side-by-side. At drop-off I saw some exciting things, including work on plexiglass by one alumnus. The show will include paintings, ceramics, sculptures, and more. 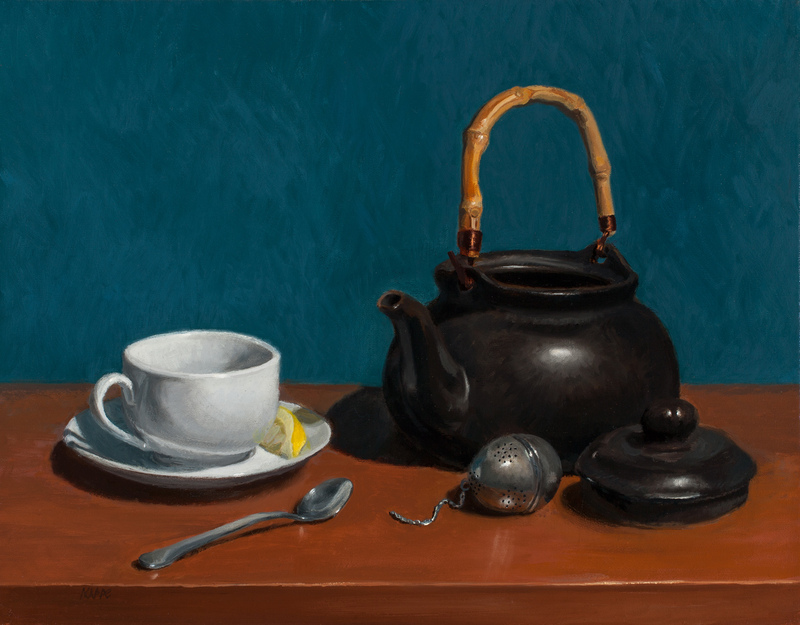 Even though my painting in the show “Winter Tea in Kennett” was a 2013 Art of the State of PA award winner, the goal of this still life was to express the form and color of simple objects like a donated teapot I picked up at the Salvation Army, a cup and saucer purchased from Bed, Bath, and Beyond, and a tea fob that was my fathers. On the technical side, it was a challenge and a lot of fun to render the form, get just the right colors, and push the values in the painting. While this might look like a tightly rendered painting, it’s really not. There are a lot of painterly brushstrokes — and that’s one of the most enjoyable experiences of painting for me — capturing something with paint from my brush. The college opens all its exhibitions to the public free of charge. For more information on the exhibition or artists in the show, contact the Gallery Director, Holly Cairns by phone at 215-619-7349 or email her hcairns@mc3.edu.